16 employees at Kids Link International Adoption Agency of Cambridge, Ont., were laid off on July 10. On Monday, business was halted at Kids Link (operating as Imagine Adoption), leaving about 400 Canadian families and their adoptions up in the air. The families paid up to $25,000 in fees in advance. BDO Dunwoody was named as bankruptcy trustee. Initial figures showed the agency has $1,086,004 in liabilities and $723,004 in assets, for a $363,000 shortfall, to which could be added $800,000 in fees from 400 families who applied to adopt. Families are to submit claims once they get information packages to go out this week. A creditors meeting has been set for July 30. A preliminary bankrupcty report said Imagine Adoption owes $80,000 for two leased luxury vehicles and $13,000 a month for three rented properties in Cambridge. Companies also owed money include a swimming pool business, a home-renovation contractor and a landscaper. Imagine's executive director Sue Hayhow and her common-law partner Andrew Morrow left Canada and arrived in Ethiopia July 13 at 3 p.m. ET. They went to help at the transition home caring for 40 children already matched with Canadian parents and were in touch with the bankruptcy trustee. Mr. Morrow is on the agency's three-member board of directors. In the July 15, 2009 Globe and Mail this photo appeared of Jenn and Matthew Garside of Paisley, Ont., with Zion, 3, left, and his twin brother Azel, adopted from Ethiopia when they were five months old. They were in the process of adopting the boys' younger brother when Imagine Adoption declared bankruptcy. Adoptive parents Jenny Adachi and Alison Smith launched a campaign to raise money for the caregivers and children at Imagine Adoption's orphanage in Addis Ababa. Through PayPal donations they raised C$3,002.52 and on July 16 sent US$1,000 to Ethiopia with an adoptive mother who bought supplies and food, and paid orphanage staff. Bankruptcy trustee Susan Taves said there are about 30 children at the agency's transition home in Ethiopia who have been matched with Canadian parents. There were no other children in the care of the agency. 370 families were waiting to be matched with a child. Imagine Adoption also operated in Ghana and Ecuador. The trustee asked creditors to come forward to register claims against Imagine Adoption. The Globe and Mail's story "Board questions adoption agency's expenses" said that among the creditors are adoptive families, a swimming pool company, a pet store and car dealerships. In Ontario, parents questioned why the province renewed Imagine Adoption's licence if there were financial problems. The Ministry of Children and Youth Services did not come across any irregularities in the financial statements, said spokesman Kevin Spafford in the Minister's Office (416-212-7159). In Manitoba, Roberta Galbraith, of the agency Canadian Advocates for the Adoption of Children (CAFAC, which also handles adoptions from Ethiopia), said, "This really is a wake-up call, if you will — that these kinds of things can occur and families need to understand that no one is immune. You have to be really cautious and careful." Ms. Galbraith said her agency, which has been doing international adoptions for more than 20 years, would not be able to take on Imagine's clients and would wait for direction from the Ontario ministry and the Ethiopian government before offering to help. In Alberta there are 64 families in various stages of the adoption process who are affected by the bankruptcy; the provincial government promised to help victims. Alberta is working with the Canadian High Commission in Nairobi to expedite the visa or passport documentation for families who have legally adopted their children. Alberta Children and Youth Services spokeswoman Cathy Ducharme said that of the six Alberta families who have legally adopted children from Ethiopia via Imagine, the province has talked to five, none of whom have gone to Africa. They have not been able to reach one adoptive family. The province is telling all Alberta families working with Imagine to stay home until the situation is clearer, and not to travel to Africa to try to retrieve their adopted children. At the Calgary agency Christian Adoption Services, which worked with Imagine, Wendy Robinson said the bankruptcy caught everyone off guard. "We had a good relationship. They were excellent to work with. The care they gave for the infants was incredible." She said it cost $1,500 to apply with Imagine, at least $8,000 to follow through on the process, plus extra costs for travel. "Who's going to trust a Canadian now? Our reputation is harmed. I feel terrible because I've been recommending them, but nobody saw this coming." Imagine Adoption ran a transition home in Addis Ababa, Ethiopia, which houses children until Canadian parents they've been matched with come to take them home. Bankruptcy trustee Susan Taves said the Canadian High Commission in Nairobi has checked that the transition home is able to continue caring for the children for the time being. Roberta Galbraith of CAFAC assured adoptive parents that the kids at the transition home would still be cared for by Ethiopia's Women's Affairs Ministry, which regulates international adoption. Kevin Spafford, spokesman for Ontario's Ministry of Children and Youth Services, said the province is working with the federal government to expedite visas for 22 children at the transition home whose adoptions are completed. "Our highest priority is to get those kids here and in their homes as quickly as possible," he said. Another 18 children have been matched with Canadian families, but are at various stages of the adoption process. An orphanage in Ghana linked to Imagine Adoption was shut down last month over child trafficking concerns. The orphanage was run by Hands of Mercy Christian Outreach International, a non-profit group in Fort Erie, Ont. Although most of Imagine's adoptions involved children from Ethiopia, the agency was working with the Ghana orphanage — 9 children there had been matched with Canadian families. Earlier this year, Canadian Immigration put the nine adoptions on hold after local authorities closed the orphanage due to concerns that the children there were not orphans, and were taken from their families for the purpose of international adoption. Immigration spokeswoman Karen Shadd said in an e-mail, "If the legitimacy of the adoption is in question, we must take appropriate action; in these (nine) cases, we suspended the processing of files." Ministry spokesman Kevin Spafford said the adoptions were suspended when it was learned the orphanage was under investigation for child trafficking. The agency's executive director Susan Hayhow ran a charity in Ethiopia separate from Imagine Adoption called Global Reach Children's Fund. She had been fundraising to build a complex called Faith Village in Sululta to provide services such as a foster care home and a primary school. The Toronto Star reported July 18, 2009, in "MP's firm linked to adoption group", "In addition to 35 matched children in Ethiopia, 20 to 30 children at orphanages in Haiti, Brazil, Tanzania, Uganda, Zambia and Ghana had also reached that point in the costly, lengthy adoption process." The StarPhoenix (Saskatoon) reported July 18 in "Adoption journeys on hold" that the bankruptcy placed 30 Saskatchewan families in limbo. "In addition to paying $6,000 to $6,500 in agency fees, the families were required to pay $6,500 US to cover expenses in Ethiopia, including the cost of caring for the children in a transition home until they were released to the care of their new parents." Dozens of prospective adoptive parents across Ontario held meetings on July 19. They hoped the Ontario government would step in and complete the adoptions in progress. Parents wanted to meet with Ontario's minister of children and youth services Deb Matthews. Imagine Adoption was the only agency licensed by both the province and Ethiopia to arrange adoptions of Ethiopian children to Ontario parents. In Gov't looks into adoption agency bankruptcy Times & Transcript (Moncton) reported that in New Brunswick up to ten families are wondering what will happen with their international adoptions, as the bankruptcy trustee decides what will happen to the money families have already invested in the adoption process. Alison Aiton, spokeswoman for the N.B. Department of Social Development, said that the provincial government is in the opening phase of investigating whether it missed any red-flags with Imagine Adoption. Imagine Adoptions was licensed in Ontario but didn't need to be licensed in New Brunswick. There are no international adoption agencies in New Brunswick as demand is low. Waterloo Regional Police opened a fraud investigation into Imagine Adoption about July 23. They were looking into whether fraudulent spending and expenses led to the bankruptcy. Executive director Susan Hayhow is currently in Africa and police expect to speak with her when she returns. The fraud probe was launched after two members of Imagine Adoption's board of directors contacted authorities over concerns about the organization's bookkeeping. Director Alan Brown said a review of the agency's finances earlier this year revealed a string of unusual expenses, such as a $3,000 horse, a $2,700 saddle, a $13,000 weeklong hotel stay in New York, two trips to Disney World and renovations to Susan Hayhow's Cambridge home, recently mortgaged for $500,000 at a rate of prime plus 7 per cent. Families left in the lurch by Imagine's bankruptcy may have another option to bring a child home — adopt locally, with no fees. Family and Children's Services says there are plenty of local children who need adoptive parents. It placed about 60 kids in homes last year. Six adopting families met with officials of the Ontario Ministry of Children and Youth Services July 24 in Toronto. Christine Starr of Families of Imagined Adoption, a group representing the families, told a news conference they asked officials to help all families which had a retainer agreement with Imagine Adoption, no matter where they were in the adoption process. The families asked the ministry to consider a transition plan by which the ministry would hold Imagine Adoption's licence while it acted as an interim operational trustee until the agency could be restructured. The Calgary Herald reported July 25, 2009 that a Toronto mining company has donated US$100,000 to care for 43 Ethiopian children awaiting adoption. The money will keep the transition home in Addis Ababa afloat until the children leave for Canada. Yamana Gold's CEO Peter Marrone said his company made the donation after its vice-president of communications Jodi Peake, who adopted an Ethiopian boy last year, told him of the plight of the children. 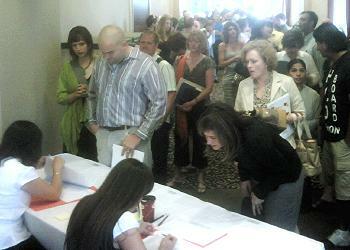 The news was welcomed by 40 adopting parents who met July 25 in Calgary. At the meeting Alberta's head of adoptions Anne Scully said the province is working with the Ontario Ministry of Children and Youth Services and Canadian Citizenship and Immigration, to move adoptions forward as quickly as possible. 64 Alberta families were clients of Imagine; six of them had been matched with children and five of the six adoptions have been finalized in court. Their next step is to get passports or visas issued by the High Commission in Nairobi. In a news release, the bankruptcy trustee said it would manage all 400 outstanding Canadian adoptions regardless of their state of completion. On July 28 some families impacted by the bankruptcy met Minister Deb Matthews to ask the province to step in and complete the adoptions. She said that the province would consider a licensing request from a reconstituted agency emerging from bankruptcy, and that home studies by Imagine could be transferred to other adoption agencies. Ontario is working with the federal government to expedite visas for children whose adoptions have already been completed. A ministry news release on July 28 stated that since the bankruptcy at least nine Ethiopian children have received their visas and are travelling or have arrived in Canada. An estimated 36 Ethiopian children have already been matched with Canadian parents and are being cared for in the transition home. On July 29 at a meeting with London parents Minister Matthews said 23 Ethiopian children were now coming to Canada to their new homes, now that the last hurdle has been cleared. Canadian paperwork should be completed by the end of this week. 46 other children are close to having their adoption approved by Ethiopian courts. BDO Dunwoody held the first general meeting of creditors July 30 in Kitchener. Claims against Imagine Adoption are $3 million, much higher than first thought. Bankruptcy trustee Susan Taves said some creditors have offered to waive their claims to ease the burden on the agency, which has $500,000 in cash left and about $150,000 in receivables and office equipment. She said she has been in regular contact with Susan Hayhow, and that Ms. Hayhow recently returned to Canada from Ethiopia. Imagine had 375 files of families waiting for matches for children from around the world. Ingrid Phaneuf of Families of Imagine Adoption said the families did not discuss getting their money back, and would forgo their financial claims. She told Kitchener radio station 570 News that there was a unanimous decision from creditors — from the families to the landscaper — to get Imagine's bankruptcy status annulled. The nearly 200 creditors voted to ask the courts to annul the bankruptcy so that the agency could be restructured and hundreds of pending adoptions completed. A new slate of directors would need to seek the provincial ministry's approval. Five people, representing affected families from across Canada, were appointed to oversee the restructuring process. BDO was directed to work on filing a proposal to creditors. "What a moving moment it was to see all 189 people present vote in favour of working towards taking the agency out of bankruptcy," Christine Starr, chair of Families of Imagine Adoption, said in a statement. In the Sept. 1 Record (Kitchener, Ont.) Brian Caldwell wrote that Saint Anne Adoption Centre didn't have enough money to save it from bankruptcy. Saint Anne had $45,000 in the bank while 25 of 29 affected families have filed claims of about $425,000. At the July 30 creditors meeting clients voted to dissolve Saint Anne and take their case files to other agencies. Saint Anne and Kids Link International Adoption Agency operated under the name Imagine Adoption. Kids Link went bankrupt July 14, 2009. They shared offices and staff but were legally separate because they held provincial licences to operate in different countries. Caldwell reported, "Bankruptcy trustees determined executive director Susan Hayhow and her estranged husband, Rick Hayhow, the chief financial officer, were earning a combined annual income of $284,000 from the two agencies. ... The estranged couple — who split up after Susan Hayhow began a relationship this spring with Andrew Morrow, another key figure in the organization — also drove a $72,000 Lexus and a $42,000 Nissan Pathfinder leased to the agency. More than $300,000 in suspect expenses charged to Imagine included trips to Disney World, a $13,000 hotel stay in New York, clothing, spa visits, a horse and saddle, and extensive work at the couple's Cambridge house." In British Columbia, the bankruptcy has affected as many as 80 families, wrote Darah Hansen for the Vancouver Sun on Aug. 4. A spokeswoman at B.C. 's Ministry of Children and Families said the ministry is working with its counterpart in Ontario, as well as with federal officials, to define the options available to help families complete their adoptions. Lawyer Ted Giesbrecht of Kitchener volunteered his services to help stabilize the transition home in Ethiopia, and help families get their children home to Canada. He said if the home was not stabilized, the agency would have lost its licence here and in Ethiopia, which means adoptions would not happen. Giesbrecht said the adoption of 17 children to 13 families has been completed; all but one of the families are back in Canada. He said there are 19 families whose cases are being processed. 14 more files are being reviewed by the High Commission in Ethiopia. About 25 children remain in the transition home and are being well taken care of. He said there is enough funding to care for the children through September and October if needed, but most should be ready to come to Canada by the end of this month. The Saint Anne Adoption Agency, which shared staff and an office with Imagine Adoption, is officially bankrupt. 29 families hoping to adopt from South America and the Caribbean were affected and may be able to transfer their files to other adoption agencies. Four of Saint Anne's five directors claimed they had resigned or didn't know they were listed as members of the board. Saint Anne has $35,000 in the bank. Creditors are to meet Sept. 1. For more information, see the bankruptcy trustee's Saint Anne page at BDO Dunwoody. BDO's update of Aug. 14 said that the Ghana adoption program was under assessment, with the concern being government statements about possible child trafficking by the orphanage and the Canadian contact. Imagine Adoption had not completed any adoptions from Ghana. Saint Anne Adoption Agency creditor meeting was held. Families voted to transfer their files to other agencies because there wasn't enough money left to save Saint Anne. The bankruptcy trustee, BDO Dunwoody, proposed to creditors a restructuring of Imagine's business. Here are some highlights from the restructuring proposal. 25 trade creditors are owed $103,743. About 350 families are also creditors (not including Saint Anne families, who are not part of the proposal). Families are asked to make "renewal fee payments" to restart operations: $2,000 in 2009 and $2,000 in March 2010. If families can't adopt through a country, they can change countries and keep their priority position. The reinstated Imagine Adoption will have new management which will ask the Ministry to renew the agency's license. There will be a Board of Directors and an Advisory Committee. The Board is composed of Martha Maslen, Scott Farrell, Rob Eagleson, John Hamilton, Kelly Cussons, Samuel Getachew, Lianne Armstrong and Christine Starr. Sitting on the Advisory Committee are Ted Giesbrecht, Kim Fletcher, Susan Crawford, Shelley Green, Mary Howlett Nero, Donna Durant, Reg Peterson, Dr. Jack Albin, Dr. Jon Boyd, Dr. Kim Ireland and Rev. Gordon Lewis. An executive director has not been chosen. Christine Starr, chair of a group of affected families, said in a release that she is pleased with the plan despite the call for extra money from clients, some of whom have already spent $15,000 or more. Adoption referrals would resume in 2010, and Susan Taves said 270 adoptions are expected to be completed within two years. The restructuring plan needed to be approved by two-thirds of the creditors for it to go forward. At the creditor meeting on Sept. 21 about 270 family votes were received; 248 were in favour. The proposal to restructure was approved and is being filed with a bankruptcy court judge for final approval. The hearing is set for Sept. 29 in Kitchener. The new Board, Advisory Committee and the trustee are discussing the transition for Oct. 1, 2009. This includes hiring staff, sending the renewal contract to families, collecting the $2,000 fee for 2009 and talking with foreign countries. Under the plan clients must pay an extra $4,000, plus any outstanding fees, to revive the agency. Brian Caldwell wrote in the Record Sept. 21 that it's expected to take about two years to clear the backlog of cases, mostly for adoptions in Ethiopia. On Sept. 29 a court in Kitchener approved the proposal to bring Imagine Adoption out of bankruptcy. The board of directors is able to take over running Imagine, hire staff and search for an executive director. In a news release, the Ontario government said it supports re-opening Imagine Adoption and is granting affected families a six-month extension to home studies expiring before April 2010. (Since 2000 about 6,900 Ontario families have had home studies for international adoption approved by the ministry.) To strengthen the international adoption system it will make international adoption agencies more accountable by requiring them to provide an audited financial statement and an annual report when they renew their annual licenses. The Ministry of Children and Youth Services has asked a working group of licensed agencies to look into an insurance plan to protect prospective parents should an agency collapse. The release added that 38 of the 47 children matched to Canadian families and living in the transition home in Ethiopia have returned to Canada with their adoptive families. In a Canadian Press story, Board member Rob Eagleson said the re-formed agency can now "start moving forward with international adoptions for the many families ... The first step for us is to re-establish the relationship with Ethiopia and the orphanages that are in Ethiopia, then we'll have opportunity to start matching orphans in Ethiopia with families here in Canada." An update from the trustee BDO Dunwoody (Susan E. Taves) and the new Board of Directors (Kelly Cussons) said BDO gained court approval of the restructuring proposal on Sept. 29, 2009 and is proceeding with the plan. Priorities of the Board of Directors in restarting operations include issuing the family renewal contracts (to be sent by email), hiring staff, applying for license renewal by the ministry and contacting Ethiopia regarding orphanage relationships and transition home needs (travel to Ethiopia before Nov. 30).